I have a website where I want to advertise a specific product/service. Is it OK to use a modal that grays out the rest of the screen to show this product, or will this turn away visitors? Edit: The modal I am planning on using will appear in the center of the screen and overlay the rest with grey. The box will contain a coupon code for $50 off and a small Google ad. The box can be easily closed with the X button in the corner and by clicking outside the box. It it mostly unobtrusive. In the name of all internet users, I beg you not to use a pop-up advertisement. Nobody likes pop-up advertisements. Nobody. Okay, that's not entirely true. 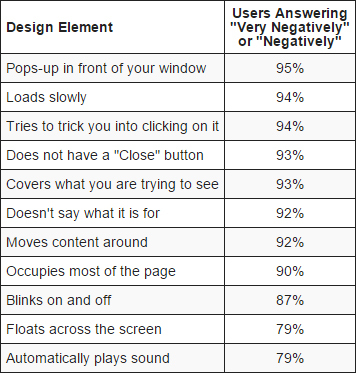 95% of the internet doesn't like pop-up ads, according to the Nielsen Norman Group. They did a quite interesting study on the impact of advertisements on the User Experience. Users not only dislike pop-ups, they transfer their dislike to the advertisers behind the ad and to the website that exposed them to it. When I saw this advertisement, I had to put it on twitter and had to do meditation to calm down. "Skip this ad" is hidden in the corner and it's not very clear that this is an ad. So people will stare to the screen a couple of seconds thinking "did I click the right link?". This is not a pop-up advertisement (it's a redirect), but it comes close to a pop-up. And for the users, it won't be any different. 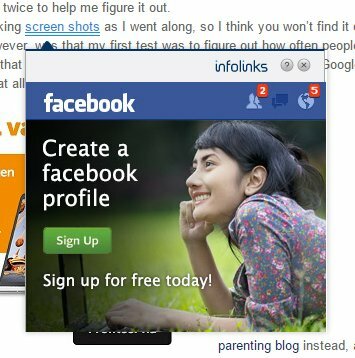 A pop-up advertisement that grays out the content is something most users will instantly click away or dislike at first, because it prevents them from getting to the things they came for. I once saw this website which used to put advertisement pop-ups behind random words, making them look like links. These sneeky pop-up ads don't look very reliable. And it's distracting. Once people hover over the link (accidently or not), it's blocking content. Nielsen's study has some tips on the good way of advertising. provide additional information without having to leave the page. Advertisements on the sides are often completely ignored. Placing ads between paragraphs of content won't hurt if they are relevant to the content and if they are interesting for your website's target audience (keeping the points above in mind). Short answer: don't use pop-up advertisements. Not the answer you're looking for? Browse other questions tagged popup advertisement or ask your own question. Should I close popup when use 'Back' key?